When you want a challenge try building one of the most complicated Lego sets. 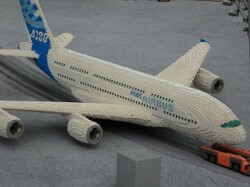 Adults and older children get a real kick out of building things with the popular building bricks known as Legos. Sure, they can build the simple sets and do but the serious Lego fan often wants a real challenge. So, I have looked to see if I can find the most complicated Lego sets out there this year. These will make wonderful gifts for the "brick" builder on your gift list! Amazingly they come in a variety of styles to suit the interest of just about any person on your gift list, too. There are architectural wonders made with the colorful little bricks but there are also ones that involve movement like train sets and robotics. Some of the largest and most difficult are in the Star Wars line which fits two interests, people who live with the "force" and Lego fans. There are some people who are so creative and inventive that they come up with their own projects to create the most incredible things out of Lego building bricks. They come up with elaborate and complex designs and then start building. I admire them! It is sort of like those talented people who create art in the sand at the beach. They do it for the shear joy and sometimes for the competition but they are not using a kit that can be purchased to build, they just see it in their heads and go for it. You do not have to be in this category to build a complicated or complex set, though. There are some really difficult kits for those of us who need some direction and a challenge in what we are building. Some involve the enormity of the many pieces and getting everything to work in the place it is supposed to be. While other sets have motorized parts that need to be put together and some even involve not only a motor but robotics. Obviously little kids are not going to enjoy these Lego sets but advanced Tweens, Teens and adults get a real kick out of them. I mentioned earlier that there are Lego sets for the ultimate Star Wars fan and I wasn't kidding. There are some simple ones to build but when the person on your gift list wants the complicated stuff, Star Wars Legos has many choices for them. They can build some pretty complex things out of the Lego bricks and pieces in each of these kits. Some of the finished pieces are huge, too. They are perfect to add to any Star Wars collection along with being a fun thing to build on their own. These complicated sets are not going to be in every collection of this popular movie series and that makes it even better to the fans of this epic space adventure. There are several complex sets that will replicate famous buildings and structures of the world in kits from Lego. Some are rather easy to build while others get pretty complicated in the building process. You can choose classic styles from famous architects like Frank Lloyd Wright or structures like the Tower Bridge in London. These wonderful structures give a challenge and will take more than just a little bit to build but that is half the fun, the complexity of the build. A little more than just putting bricks and pieces together the Mindstorm line of Legos are complex, complicated and down right difficult for most to build. They are great for people who love robotics and have an aptitude for wiring and motors and all of the technical stuff! Suggestions for gifts for the AFOL (adult fan of Legos). Showing sets meant for adults to build. Fun new Lego building sets with a Halloween theme for kids of all ages to build. I remember when Lego blocks were not so complicated as to have special pieces, and one simple set was enough. Now, adults have become avid builders, so complexity is in order. Wish they'd been around in olden times, when I was a kid. I've tried a few LEGO sets and it was fun. The complicated ones are truly inspiring! LEGO in capital letters, singular. Not Legos, lower case and plural. Sorry. I am a bit of a brickhead, and I know my terminology. That said, the more complicated the set, the better. It's been ages since I last played with lego but that's a welcome reminder! These look really challenging. I wonder how they ever made that gorilla.